Sigh, I am again reaching into my past for a metaphor. But hey, this is my blog, my game board, and I get to do what I want. My older sister and I have always been a bit competitive in playing games. Harriet and I go head to head with each other in Words with Friends, she often trouncing me, and sometimes, I her. I have this memory which she may dispute. That’s the thing with memory, we have out versions imprinted as truth, fact in our brains, but often it the story varies with whomever tells it. She was often more victorious than I in Monopoly, but one time I was getting all the breaks- the quick monopolies, hotels on Boardwalk/Park Place, getting the piles of cash from Free Parking, heck I bet I won the second prize in a beauty contest Chance card. I have a visual memory of her saying she was bored, yawning, hands stretching under the edge of the board, and just flipping the game board up in the air. I bet I cried and went to “tell” someone. Today Google owns a big game board on the internet where we put our effort, building, hoping for good draws of cards. But it’s totally their board. And who knows if it’s boredom, but they seem to get bored too, and just flip our little plastic buildings and fake deeds in the air. Need I mention Google Reader? Buzz. Answers. Orkut. Wave (well that was a good choice). Lot’s more. But it’s their board, they can do what they like. A year ago they decided to stop allowing web content to be hosted in Google Drive. Usual reasons. Other options are out there. They want to focus their energies elsewhere. This has an effect on those of us using Martin Hawksey’s genius script for an auto updated twitter archive. But in that case they gave a full year’s notice (Martin has a short term fix and is working on a long term one, someone knight that fella). Earlier this week (well that’ when I heard about it), the owner of the Googopoly game announced something that has a big impact for many of my projects (soon for the UDG Agora project), and others like Virtually Connecting, and many other educators who use Google Hangout. In one month (September 12) they were changing the way hangouts were run, moving them from Google+ (soon to be on that Wikipedia List of discontinued services, I bet) to YouTube. The reason was not clear. But the news was quickly pushed out from The Verge Google is killing off Hangouts on Air in September (totally misleading baited headline IMHO), ZDnet, 9to5 Google and probably another 100 “news stories” I could Google. The thing is– all of this rush to public stories are the same, they just re-wrote stuff that appears in the Google “announcement”. I must admit a bit of sky is falling reaction first, I usually try to avoid that. And I was in at least two Slack channels where people were WTF-ing, scrambling to find info. I am sure it was repeated elsewhere. They new interface for running Hangouts is within YouTube. That kind of makes sense. But they have co-mingled the “advanced” features that video pros like Andy Rush would use. If you are trying to figure things out and are in the area of downloading encoders (like I did), you are in the wrong place. There are stuff for video producers to do more with multiple sources, scenes, etc. 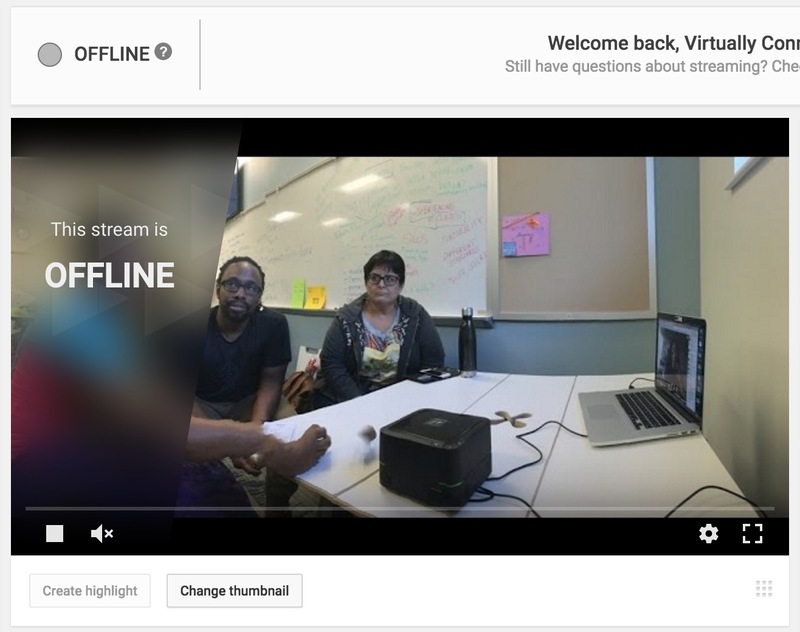 So pretty much you can still schedule Hangouts, or just run them on one click, from the new YouTube Creators Studio under Live Streaming– or https://www.youtube.com/live_dashboard. The thing to ignore is the links and the blue banner nudges to try the new improved “Stream Now” — those all lead to encoder land. If you end up having to choose encoders, go back. Use Events to do Hangouts as they were. I’ve got things set up (for now) in a way I understand. The one nut, as described in the video above, are the new hoops one has to jump through to have a live video stream embedding in another site. Until now, when you scheduled a Hangout, it provides you the Watch URL, the YouTube URL you send viewers, and that URL also becomes the link for the archive. This works well for our Virtually Connecting events, as we can announce them with a time converted, and in WordPress include the live stream / archive URL by just putting the URL on a blank line (see the most recent event). But now, sigh, to embed a live stream in your blog, you first have to click through screens to accept, and create settings for advertisements. The embed option is still not active. Then you have to go create an account and link your google account to Adsense. Even if you have no plans to run ads, apparently Google does. To activate adsense, you have to provide a mailing address, phone number etc. All of this to be able to embed a live stream. I started down the road to set this up for our UDG Agora project. I followed the idea we do in Virtually Connecting- I created a new Google account, and use the Chrome feature to log in as another user. Because our hangouts will have different hosts, by sharing access to this account, all of our Hangouts will land in the same YouTube Channel. In about 10 minutes of trying to set everything up to get the new embed settings cleared, I had 10 Google tabs open. There’s a clear button to run the hangout, and later today I will schedule in all 8-10 of our planned events. If you click “Edit”, the Watch Page button in the top right leads to the public URL (the one again where people where watch and where the archive will land). The one for this event is https://www.youtube.com/watch?v=bRrRZrmoJvM. What I wondered was, while I expected the WordPress autoembed to fail (because I opted out of ads / adsenseless) I was curious if an archive would embed, because at that point, it is just a YouTube video. 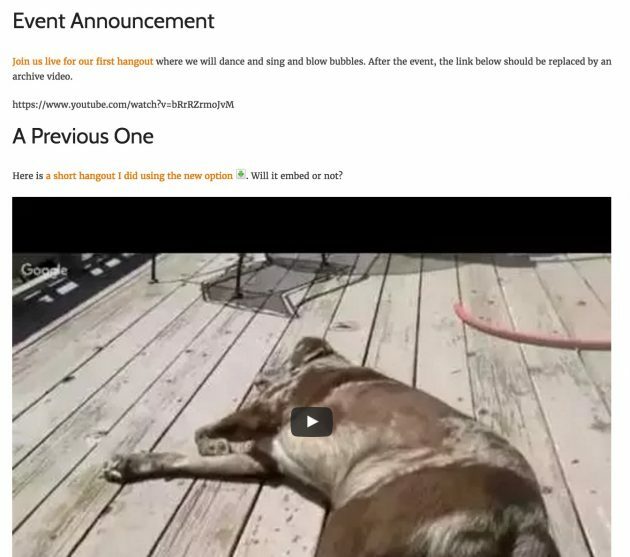 So I did a 40 second Hangout on Air of my dog sleeping on the deck (it is that exciting around here). As expected, the scheduled link does not embed but a past one does. This says to me I can skip the adsense nonsense, and on event pages, just have a link to the URL before the event, and replace with the URL so it embeds after (I am betting I could write a WordPress plugin with a shortcode that would handle it automatically). Once in a hangout, everything is the same as it was. All the changes are in how you set them up. Now this is super handy. This is one URL you can use to announce how to watch a live stream, no needing to dig out the URL. For Virtually Connecting, if we are running a live stream, it can always be watched at http://www.youtube.com/c/VirtuallyConnecting/live (when done, it is archived at its own URL). This makes announcing events easier, you can even tweet out from that dashboard. I don’t have all the answers, but I do not find them by reading those off the cuff posts on tech sites. Frankly, the way Google intertwines the new complicated stream features with the traditional hangouts is confusing. And that nonsense with needing to sign up for adsense looks like something designed by a committee of engineers. Google has, does, and will continue to flip the board on you. Why? Because they can. No, it’s because you should always keep in mind that despite messages of not doing evil or being committed to education, Google’s prime directive is to make money by selling advertisements. Everything is about serving ads based upon all the information they garner from you. And your image of “The Cloud” might be fluffy stuff of negligible weight, software services in that cloud need large physical infrastucture, rows of boxed servers, electricity, cooling, etc). The cloud has to be paid for. And it is paid for with advertisements, fine tuned by your personal dada. In many cases, I you, everyone else, sacrifices their information in the bargain of getting a service that looks free. But Google never sees you as an individual. They do not see that announcing a change of service in August might affect teachers who have made plans for courses starting now or in a few weeks. They do not see that as a small non profit organization you are too busy trying to do your work on thin budget then to spend time figuring out some new arcane interface. Google only sees you in an aggregate of massive data. You are an averaged sum to them. So it’s useless to speculate why they change/delete things. The answer is easy. If it does not make ad money for them, it will be tossed into the air. Your class, your project, your fan club, you– as an individual — do not matter to them. That’s how we play but really are played, by Googopoly. Ah, the good ole Monopoly board incident. I don’t remember it but it sounds like something I would do. If I had know you’d grow up to be bigger than me, I probably wouldn’t have done it!! Good post, especially the bit telling me I can do a live video under ‘Events’ (who would think to look there?). Though that said after using the video encoder I find it’s a much better video. But Google is really sneaky the way it introduces it. Hangouts used to be a quirky tool worth teaching people how to use, now I’m struggling myself, and know my colleagues just won’t get them. Yet again, Google have cocked it up royally. Sigh. Organisations are losing patience with Google because tools either wither on the vine of lack of progression and development or just get shafted.